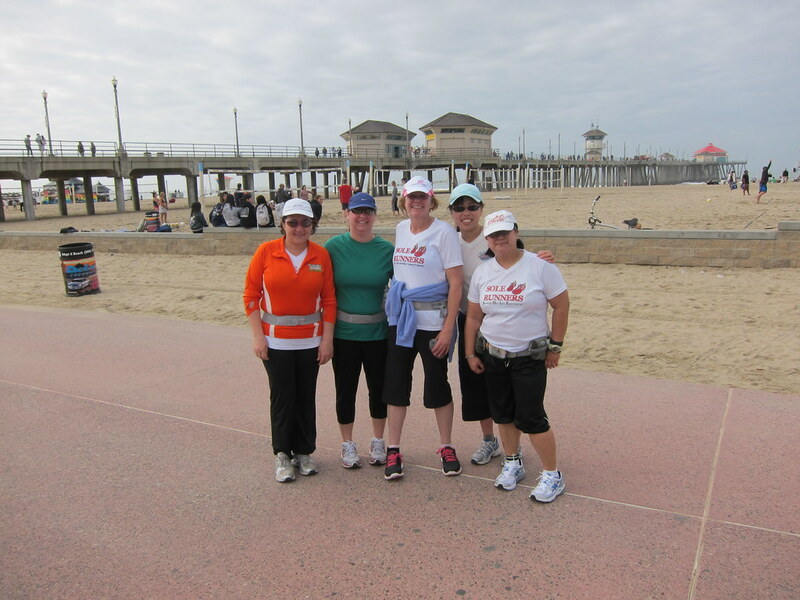 The Green Girl led her first Sole Runners run yesterday at Bolsa Chica State Beach. Our running group is officially on a short hiatus between the winter and summer training sessions so only a handful of runners showed up. One of the Sole Runners, Katie, helped us remember all the body looseners before we started our run. Just as we were heading out, some friends from The Misfits running group ran by and we chatted briefly. 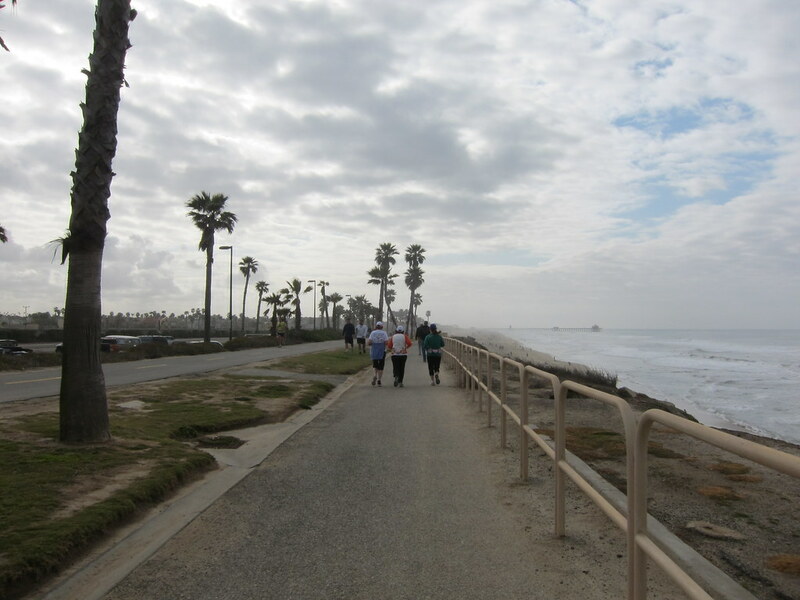 The beach path between Bolsa Chica and Huntington Beach is filled with vivid memories of training for my first marathon. It was a chilly morning with an overcast sky. As my feet fell into a steady rhythm, I listened to the soothing roar of the waves. 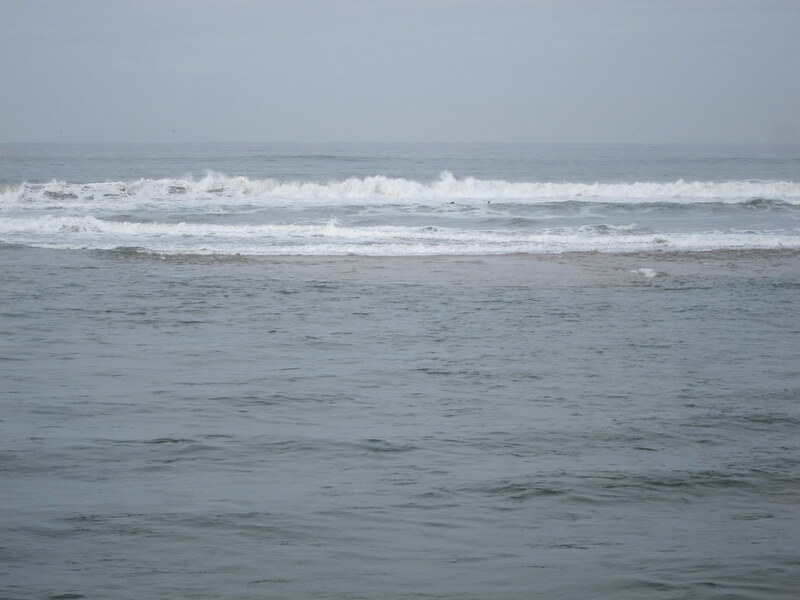 The ocean was spotted with surfers. I watched in awe as the foamy waves would completely envelope a surfer for seconds at a time. I thought about how lucky I am to have so many beautiful places to run. By the time we reached our turnaround point, the Huntington Beach Pier, the sky had cleared and the sun was starting to warm the air. Funny enough, I took that picture underneath the pier yesterday around noon. When did you guys hit the turn? Huntington Beach. I remember going there in 1990 on my first trip to Cali. I made my sister take me to where the Op Pro takes place. sounds like a wonderful run, love your pictures too. A great run with beautiful surroundings! You make it sound so peaceful. I wouldn't mind belonging to a group called The Misfits. Beautiful!! We are so lucky!! Great run!! BUT THAT little turtle IS SO DARN CUTE. I think I would fit in pretty well with the misfits. Like, my favorite part of Rudlolf is when they are on the land of misfit toys. They are the best. Not sure where that came from, but hey! It must be so wonderful to run in such a gorgeous place! I need to plan a race/vacay in Cali for sure. Lovely pictures. And lovely words to describe your experience. I felt like I was there with you. Congrats on the lead girly!